Shah Jahan's testimony of love for his wife Mumtaz Mahal, the Taj Mahal, won it the stature of being one of the world's seven wonders, and a not-to-be-missed-destination for honeymooners. Situated in Agra, 253kms from Delhi, the Taj Mahal can be covered on your way to or back from Rajasthan. To view this stately monument in entirety, you need at least half a day. It took almost 17 long years and an army of craftsmen and artisans to complete this monument to perfection. Crafted from white marble and complex inlay work using semi-precious stones and floral carvings, the architecture uses a fine blend of rounded minarets, domes and pillars which blend in wonderful harmony with the greenery of the rectangular gardens in the foreground. The Taj Mahal in Agra is best viewed in the moonlight, and the authorities allow 400 tourists only to view this beautiful monument on just five moonlit days of the month. You can plan your trip to this romantic destination accordingly. Agra was the capital of the Mughal Empire that ruled large parts of North India from 1526 till Shah Jahan shifted his base to Delhi in 1658. The city has other splendid monuments of the era which are also UNESCO World Heritage sites, like the Agra Fort and Fatehpur Sikri. The Agra Fort was built in 1565 with red sandstone and was partially replaced with marble and pietra dura inlay at a later date. The recipe of the romantic Honeymoon in Agra needs Taj Mahal to be garnished with the Palaces of Jaipur. Hence, we have introduced two days trip to Jaipur in the itinerary of Agra Honeymoon Tours Packages so that you can enjoy the Monument of Love with the comforts of Palaces. On arrival at Delhi airport, you will be received by our representative and transferred to hotel. Places to visit: Raj Ghat, Shanti Vana, Jama Masjid, Red Fort, Chandni Chowk, Qutub Minar, Humayun's Tomb, India Gate, Lakshminarayan Temple, Parliament House and Connaught Place. Early morning drive to Agra. Agra is 253kms from Delhi. 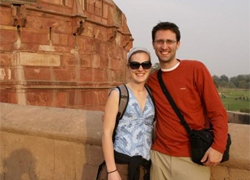 On arrival in Agra, refresh yourself at hotel and then proceed for a tour to Taj Mahal. Evening free to relax or do shopping in Agra. Early morning visit the Taj Mahal to admire this fabulous monument bathed in the glow of the rising sun. After breakfast leave for a full day tour to Agra. Full day excursion tour to Agra includes a visit to the following places: Fatehpur Sikri, Sikandra Fort, Agra Fort, Itmad-Ud-Daulah, Chini ka Rauza and Gardens like Ram Bagh and Soami Bagh. Early morning drive to Jaipur. On arrival in Jaipur, check in at a hotel. Day is free to spend at leisure. In the evening proceed to a tour to Chowki Dhani. Chowki Dhani is a well recreated Rajasthani village. In this resort you can enjoy Rajasthani dances, potters, cooks, animal rides etc. After breakfast proceed for a full day tour to Jaipur. Places to visit in Jaipur: Amer Place and Fort, Hawa Mahal (Palace of Winds), Jal Mahal, The City Palace, Jantar Mantar, Jaigarh Fort, Nahargarh Fort and Sisodia Rani ka Bagh.